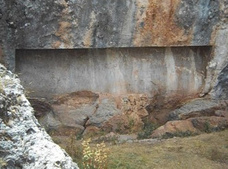 Cusco Sacsayhuamán: the walls of terrace 1 with a 10 ends stone, with a flower design, with a drainage hole, with an almost triangular stone etc. 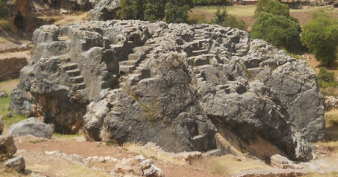 Cusco Sacsayhuamán 9-2: the big quarry 02: the rock of stairs and thrones "Chinchana grande"
Cusco Sacsayhuamán 10: chaos area: stones, walls, and thrones etc. A handicraft workshop with little stone figurines of alabaster -- The walk to "Zone X": houses, horses, views, forest, ranches -- The road and the big signpost "Laq'o" / "Laco"
The walk to "Zone X" passing a handicraft workshop for little figurines - the path in the forest with a guide - the signpost to "Laq'o" / "Laco"
The toilet house -- The last view to the big zigzag wall of Sacsayhuamán -- Hidden walls which can be excavated yet -- View of Cusco -- The polluted creek -- The giant wall with a flower design -- The flattened rock in black and white -- The view of Cusco 02 -- A little hill with a throne - and long cut stones with little channels and holes -- A giant white stone with niche, cuts, engravings, stairs etc. Cusco Sacsayhuamán part 16: the return to Cucso by foot: the polluted creek - wall with a flower design - flattened rock in black and white - view of Cusco - cut stones with little channels, holes, niche, stairs etc.